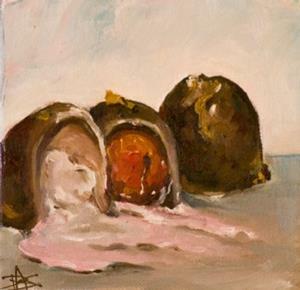 Description of artwork TITLE: Chocolate Covered Cherries This work has been clear coated to protect your investment Style:impressionism Size:6x6 Colors:brown,red,gray Depth: 1.5 Medium:oil Support:gallery wrapped stretched canvas Shipping: -USPS Priority Ready to Hang: Signature: Always Signed Paintings are shipped worldwide, personally packaged, and fully insured. I will be listing new work on a regular basis. If you don't find something on your first visit, please keep coming back. In the top right you will see a link, View Seller's Other Items. Please click this link and all of my paintings in my gallery will come up. Thank you, DELILAH .